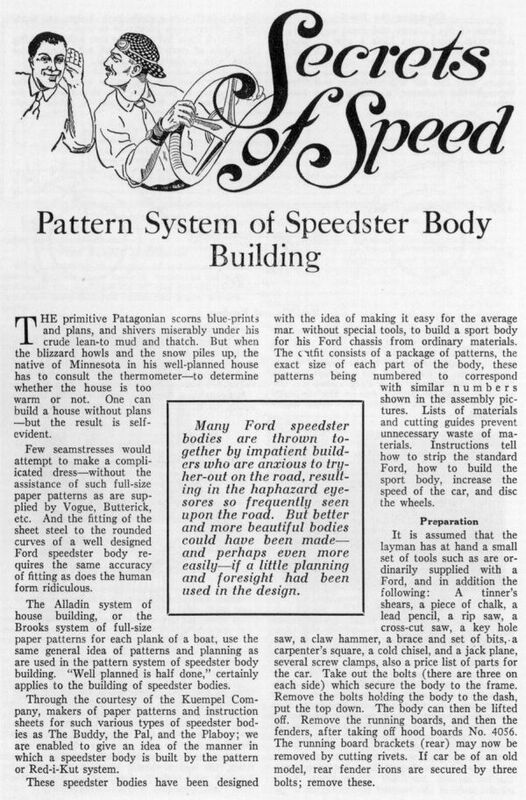 Does anyone here know if a set of these speedster plans and patterns still exist somewhere?? Jay – again thank you for posting so many interesting early photos and items. I suspect A.J. :”Art” Bell will be able to find and post the link to the patent application as he has with many other items. Thanks Art! Your links to the patents add a lot to the history of so many parts – thank you for taking the time to add those when you can. One of these days I hope to figure out more about searching the patent drawings/filings. Lots of interesting things there. If Art or some else locates those, they would probably fill in a lot of the drawings. I would like to see the method they used to lower the steering column that much. I would love to have a set of those. Great idea, still a ton of work. But what a great project. I recognized the name Kuempel right away. Kuempel (pronounced "kemple") is best known for high quality grandfather clocks and grandfather clock kits and components. 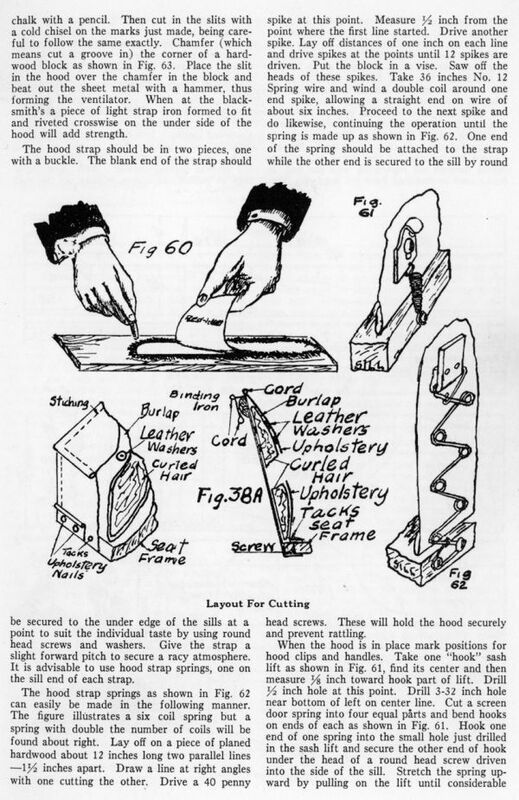 Rueben Kuempel started the clock business in 1916 in Gutenberg, IA. 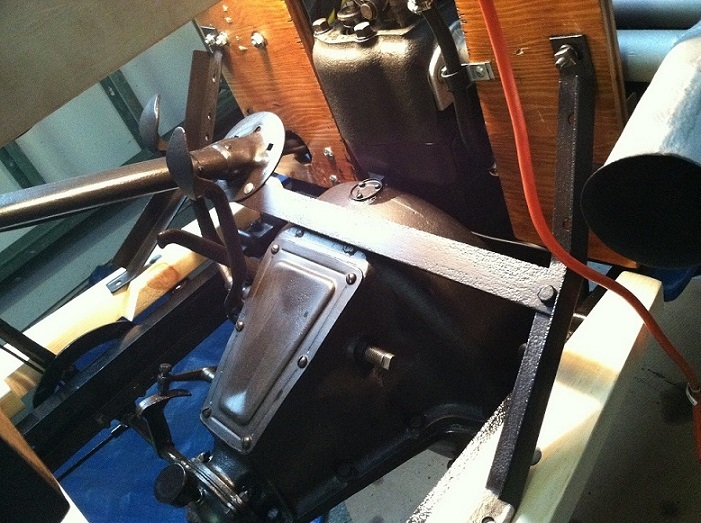 During WWII, Kuempel Clock Chime Works moved to St. Louis Park, MN. In 1970 the company moved to Excelsior, MN. I toured the Kuempel Chime Clock Works in Excelsior a few times in the 1970s as a kid. The owner at that time was Donald McGregor, who was involved in the antique automobile hobby and a friend of my father. The company sold grandfather clock kits but you could also purchase a fully assembled clock if desired. More recently, I had a neighbor who, after he retired from his day job, worked at Kuempel. The running joke at Kuempel was that the grandfather clocks were built by real grandfathers. Kuempel ceased operations in 2008. Darel Leipold, a regular poster on the forum, lives in Excelsior. He also would have known Don McGregor and would be very familiar with the clock company. It's possible that he may have information regarding the speedster plans. Jay I don't need no stinking plans, if you want 1! Now, that I think about it, I the pronunciation may be "kumple" - kump like pump. It's been a long time since I've seen that name. I'll have to ask my dad. Hap, Thanks! My hats off to Art for his ability's at hunting down patent info. I haven't had much luck myself searching patents. I was hoping he might chime in here with some patent info. Eric, Many thanks for your research! 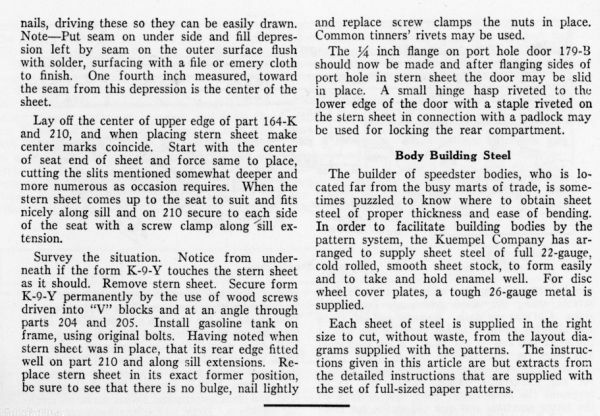 I think it would be awesome to be able to reproduce The Kuempel plan and pattern set for guys that want to hand build a period speedster using the technique of the day. Any other input here that would help locate a surviving set of these plans would be most appreciated! 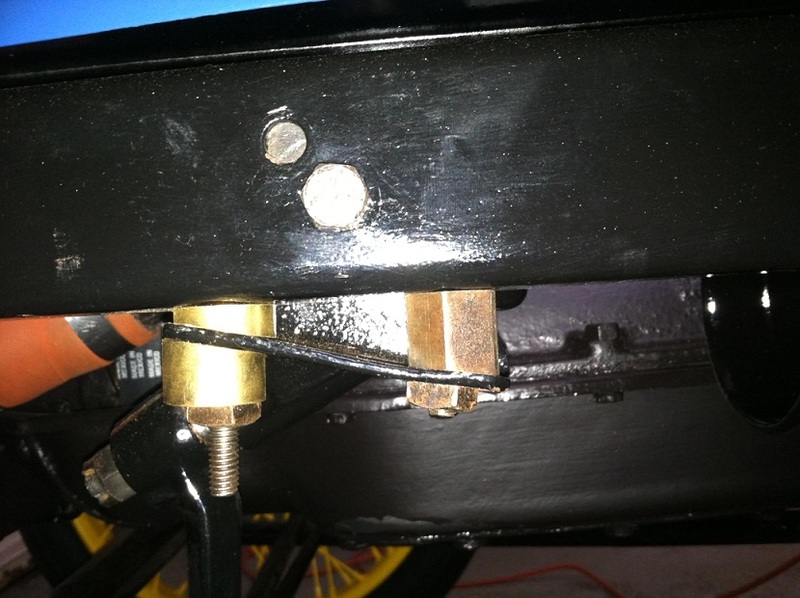 Hap, I've found on my Speedster that my Grandfather had turned over the column so that the flange was not against the firewall, and added a bracket to support the flange. 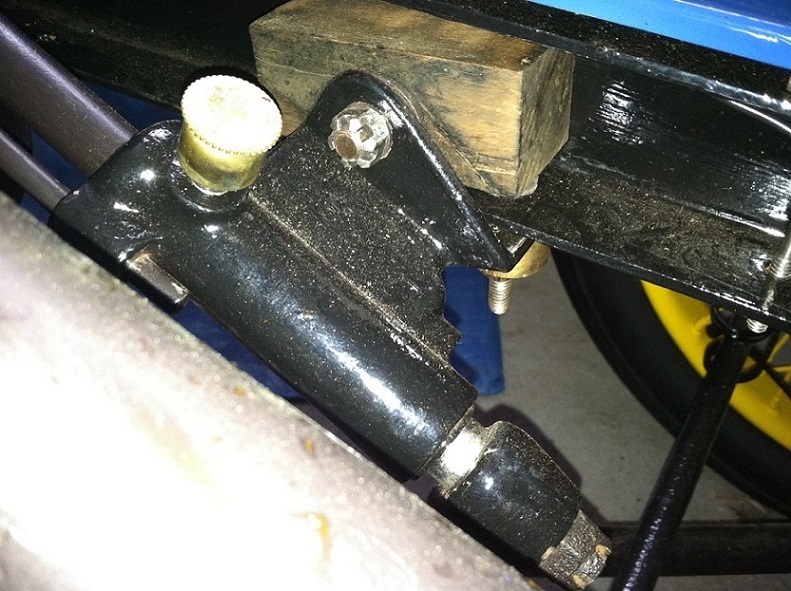 He also added shims at the column to frame bracket to alter the angle of support there. Here are a few photos of the flange and both brackets. Here you can see the resulting angle of the column. I just spoke with my father - he said he had heard about the speedster plans in the past. Donald McGregor's wife was Audrey Kuempel - she was President and CEO of Kuempel Chime Clock Works. She passed away in 2000. I have heard of the plans. 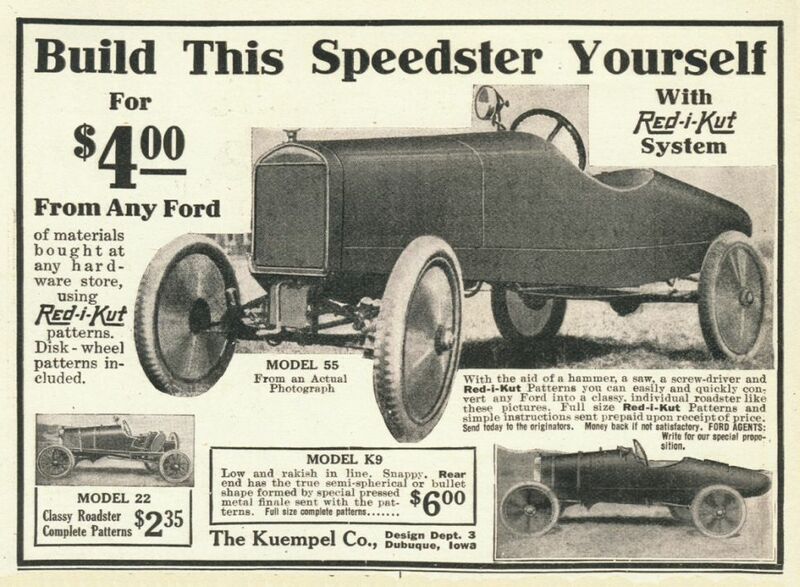 About 10 -15 years ago I wanted a set of them to build me a speedster with. I met a man at Chickashea who said he had a set and was going to let me copy them. I tried several times after the swap meet to contact him but never had any luck. Our house burnt to the ground about that time and I do not remember who he was. I believe he lived in Kansas but can not remember the town. So if he had a set of plans there may be at least one set left. If a set could be found, I think with todays technology a set could be reproduced and would be a good seller. 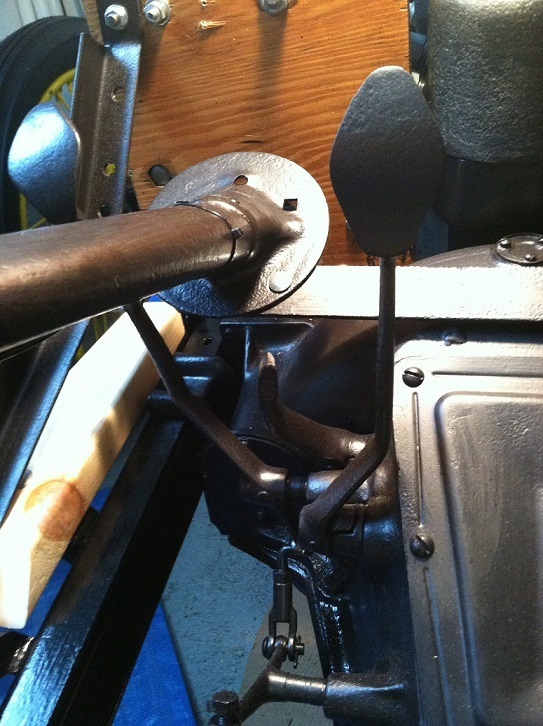 Thank you for posting the photos showing your Grandfather's method of lowering the steering column. I had not seen how they lowered one that low before. Your photos make it easy to understand how they were able to do that. Thank you. erik, macgregors lived in cottagewood, where i grew up.the old man seldom drove his cars, but his daughter drove a 36 ford pheaton all thru highschool, and into college. every day car except winter of course. her and the car were pretty easy on the eyes! 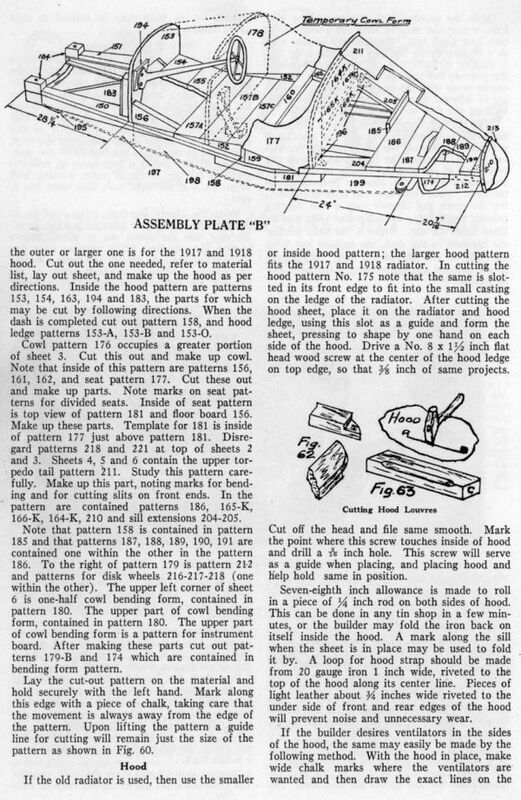 I would still like to locate an original set of these plans that could be copied and made available for guys to build period correct speedster's using period methods. Surely a set of these still exists tucked away somewhere. I think there is a market for these at whatever the fair cost of reproduction would be if you can locate a set. I'd certainly sign up for a set. 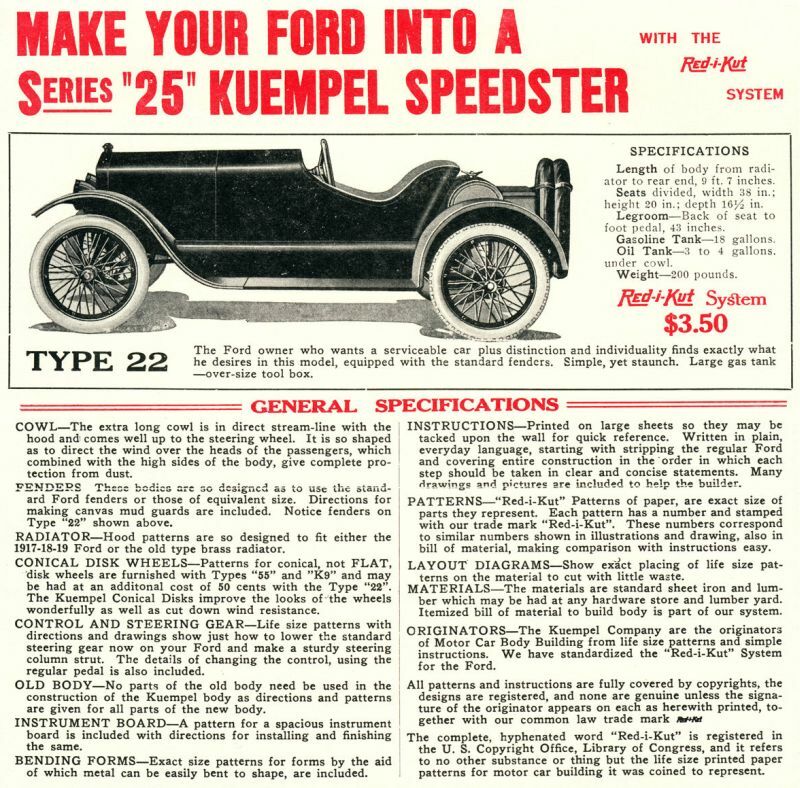 Here are a few more Kuempel and a Sport Factory version from early Popular Mechanics ads. 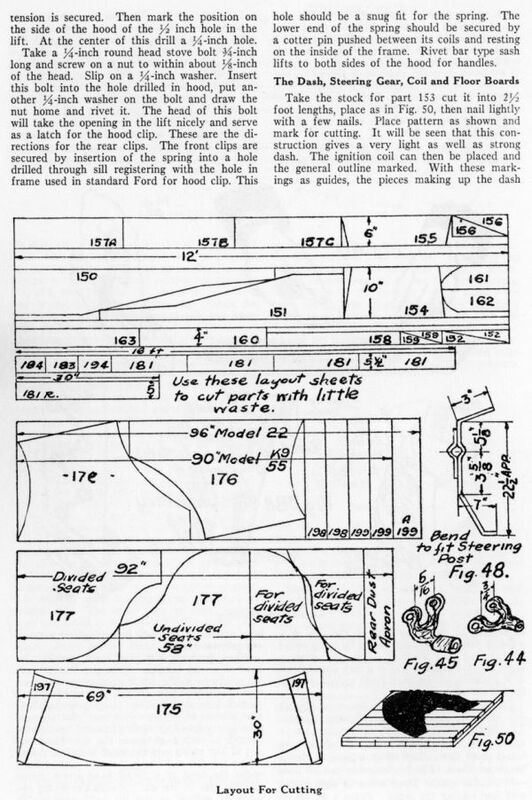 Here's some of what the Red -i- Kut plans look like as extracted from the originals for an article written for the Secrets of Speed. 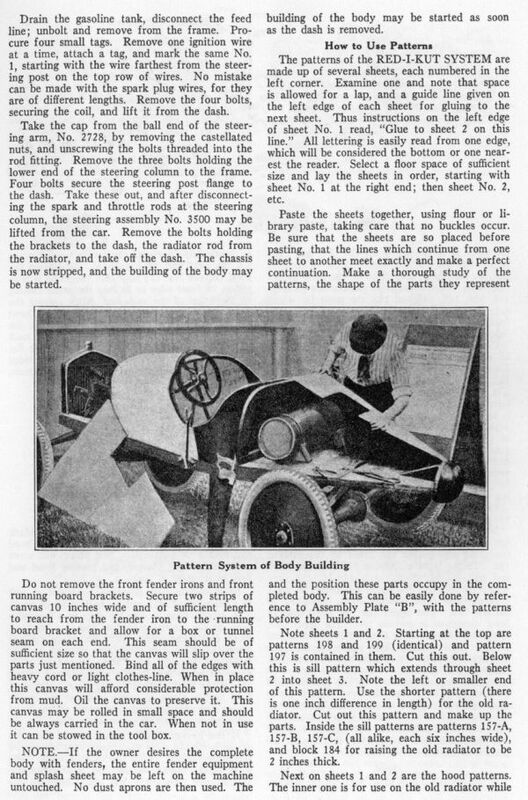 It would really be great to see the full set of these plans revived and made available to the hobby however it could be done. Printed out you're post and will see if I can find good numbers to have the copy center enlarge the drawings. To bad that there are no large copy cameras around any more. This might help some of the people interested in doing one. May not get it done tell after Xmas. I Finley Did It, Sorry. I had no plans, I just looked at how others made a similar speedster (past & present), I took numerous pictures of other members projects, made crude sketches, looked at original kit pictures like the ones above, asked many questions that were always answered by some very special MTFCA members and got started. Will begin posting; Feb. 1st 2014. 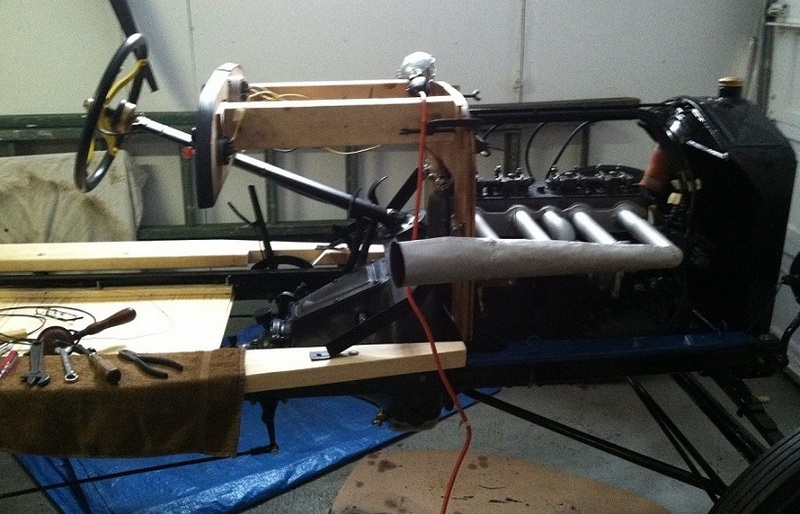 The speedster is being moved to a full-size Paint/Body shop where I can actually bend down and not knock something over. A few more details and she's ready for paint! 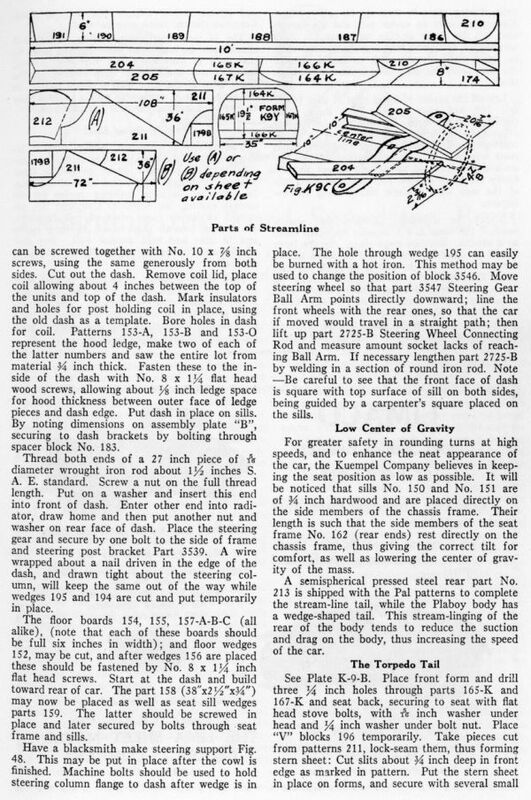 Those same pages in the same format are in the "Fast Ford Handbook" pages 122 - 128. 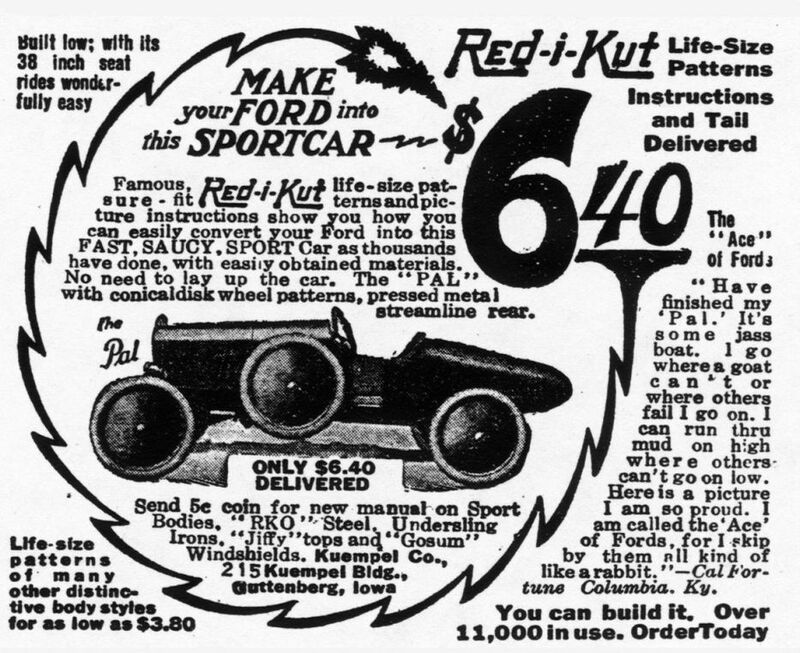 They would have most likely originally been published in Murray Fahnestock's "Ford Owner" magazine sometime back in the 1920s. A copy of the larger page from the magazine would reproduce even better if that can be located. I did not recognize the name Red-i-Kut but the photos / illustrations were easy to remember that we had seen that before. Below is one of the illustrations from page 126 to show how the higher resolution scan might help (or not).